Gardening and woodworking are scary concepts when it comes to home improvement—landscaping too. Getting our hands dirty and fixing up a few bits and pieces with some good old DIY is the best kind of home improvement. What is a dream house without a dream garden? Just imagine that lush, soft space that boosts the aesthetic quality of your house and adds welcoming touches of freshness and harmony. What is sad is that a lot of people are under the impression that a grass lawn and a few plants make a garden. Hint: it doesn’t. On the other hand, you don’t need your own personalised piece of Amazon jungle in your backyard to enjoy the benefits of gardening. Forget high costs or lack of space – there’s a solution for every problem, and that is why homify is here! Water adds a certain je ne sais quoi to any garden space. Not only is it a beautiful decoration, but it also adds sophistication, sound and life. 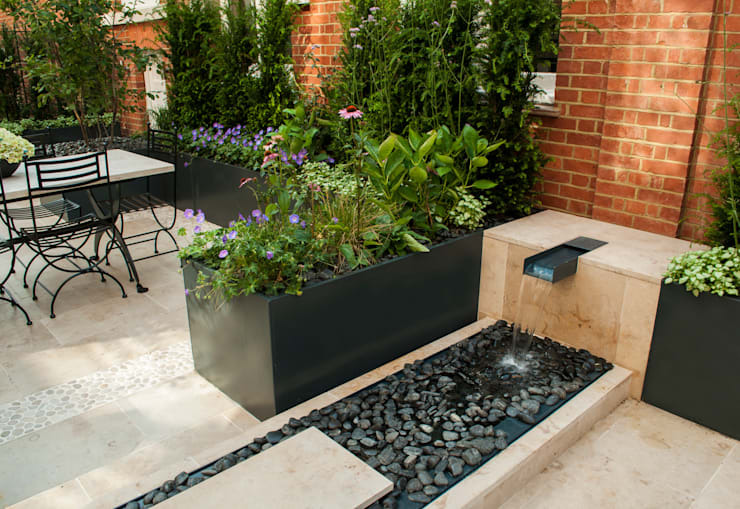 So, if your wallet and space allows for it, opt for a stunning water feature to really highlight that garden. And for some additional décor, inject some character and colour into your new water feature in the form of stones. A lot of people collect pebbles from places they visit (such as beaches or rivers) and then deposit these into their garden. So, consider this to add a personal touch to your green space. Why settle for a fountain when you can build your very own body of water? We’ll show you how to: Boost Your Garden… With A Pond. A lot of people are so busy focusing on the placing of garden stones that they completely overlook a crucial element: colour. After all, colour is what draws people (and animals) into your green space, so an adequate amount of time should be spent on deciding on the hues and tones you want to include. Colour can enter your garden in many ways: flowers, fruits, pots, or by painting a wall or fence. In addition, there’s a myriad of garden décor out there, ready to transform any garden into a wonderland (see some striking examples of modern gardens here on homify to get your creativity going). Remember: the colours in your garden should enhance the space. Using light colours in garden accessories and objects can make the hues of your flowers stand out even more. On the other hand, who’s stopping you from adding, for example, a bright orange into your garden space, as seen in our example above? Mull over your choices, and then have fun! 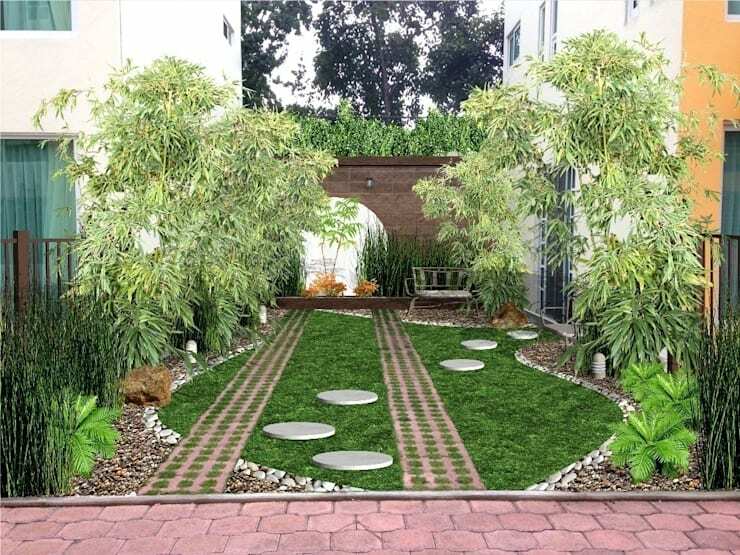 If the closest thing you have to a garden is the piece of lawn which serves as your parking area, then we bring great news! You have your canvas already, now it’s up to you to decorate it. 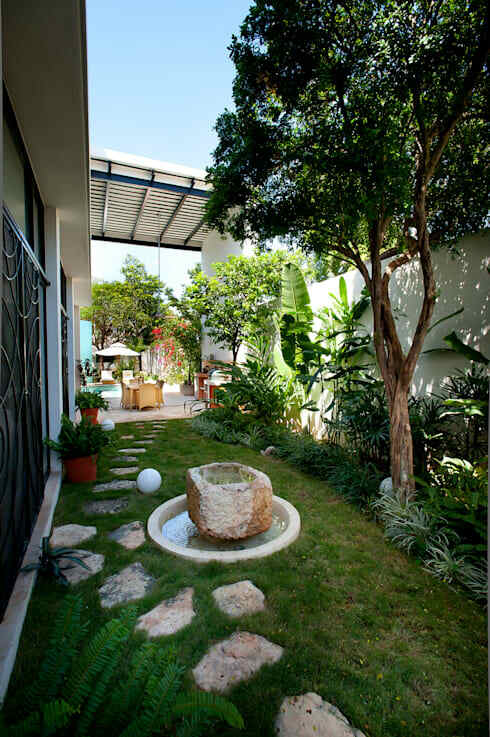 See our example above by Mexican landscape designers Zen Ambient. Notice the mixture of brick and grass that marks the wheel lanes. And how this linear design offsets with the curvy, pebbly layout framing the grass. To add some optimum greenery, the sides of the park area have been used for stone decorations and plants/trees. And there you go! A bright green garden for your parking space. Sometimes we opt for the easiest ways because they are… well, easier. This can extend to our gardens as well. 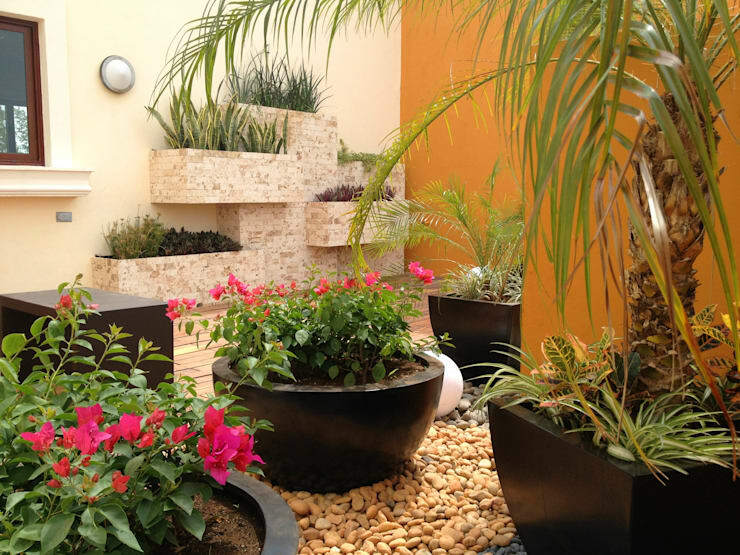 A lot of people are perfectly happy with a small, symmetrical garden: a square-shaped space with some rocks and flowers. Pretty, sure, but not very daring. There is no need to break your back in the quest for the perfect garden. Symmetry is fine. A few rocks and flowers are great. But know what can elevate them all to an outstanding status? The right lighting. Think about what lighting does as soon as it gets dark. It illuminates its surroundings, especially the subject it’s focused on. So, why not focus those garden lights on some quality space in the garden, and add some elegance (or maybe even colour, if you’re opting for coloured lights)? See the brilliant effect a few spot lights have on the garden in our image above. How often do people renovate or refurbish rooms in their houses? The kitchen needs new counters, then the living room wall gets painted… of course it’s important to keep our houses good-looking, as they project an image of what we want others to think about us. The same can be said for your garden. If you think all you need for a great garden is a few seeds in the ground and the occasional rainfall, think again. The next time a few coins become available for a house project, consider putting some aside for the garden. A little garden renovation can do any house some good, plus you’re sure to be the highlight of the street if your garden beats all the neighbours’. With overpopulation being a harsh fact and houses and apartments becoming smaller and smaller, gardens can be viewed as a luxury these days. So what if you’re pressed for floor space, yet you need that soft, lush aroma and touch of foliage in your living space? Consider a vertical garden! 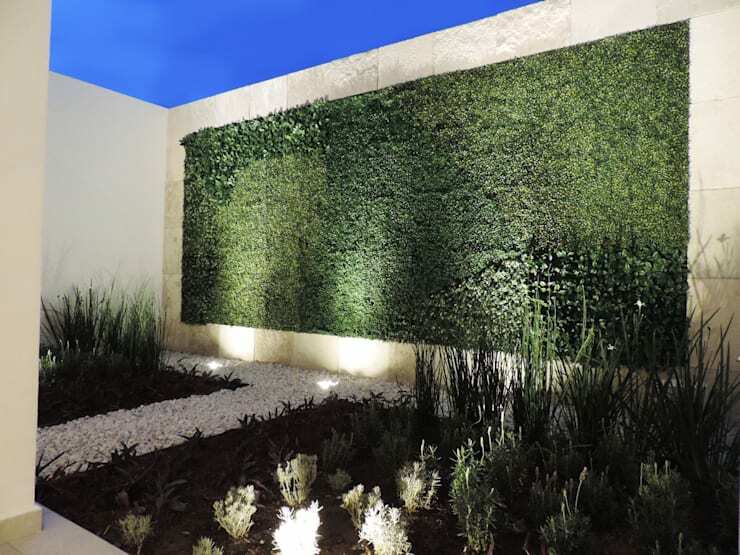 Vertical gardens (or garden walls, as seen in our example) not only save you floor space, but add a dazzling element to your house. In addition, with some clever planning, building a vertical garden can be more budget-friendly than designing an entire ground garden. 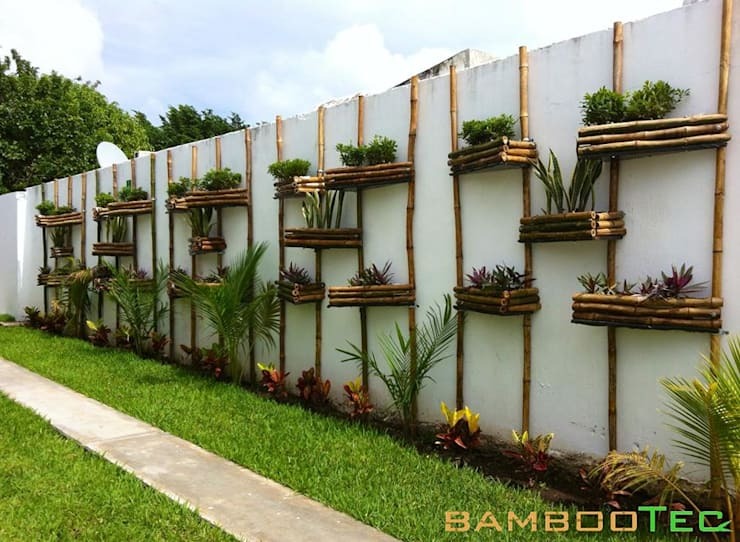 See the magic that Bambootec has created above with their boxes and bamboo lines! Last but not least, garden furniture! Whether you have adequate space for an entire outdoor living room set or only a few feet to spare for one single chair, garden furniture makes a huge difference. 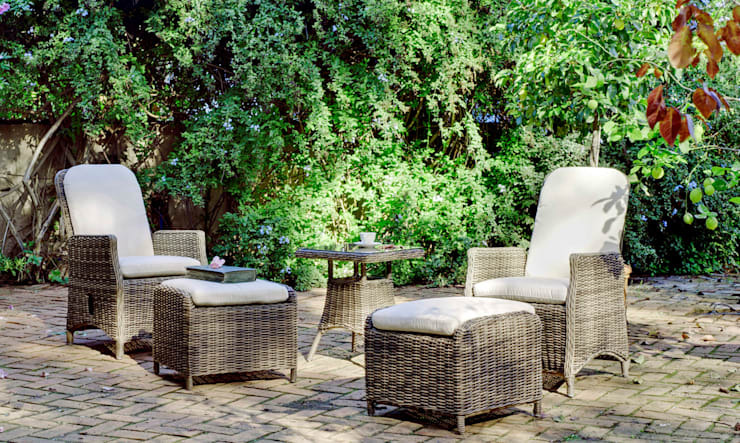 A solitary chair in your garden can serve as your reading nook or daydream space, while an entire seating set can make up a prime venue for those outdoor tea parties / wine get-togethers with the friends. Just remember what we said about colour: make sure it enhances your surroundings, as seen in this stunning example by Hevea, above. Would any of these ideas enhance your garden? Are you planning to try any of them this year? Let us know!